(B. 1918): Chief of staff and U. S. Treasury Secretary under Ronald Reagan; Board Chairman of Merrill Lynch & Co. 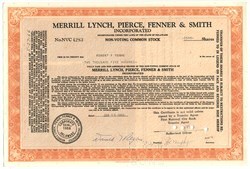 Joining Merrill Lynch, Pierce, Fenner and Smith as a trainee in 1946, Regan progressed through the ranks until 1968, when he was elected president. He was elected chairman and chief executive officer in 1971, and assumed these positions in the holding company, Merrill Lynch & Co., when it was formed in 1973. He served as U. S. Treasury Secretary under Ronald Reagan, 1981 - 1985, after which point he became Reagan's chief of staff, serving in that position until 1987. In this latter capacity, Regan directed the day to day operations of the White House and the President's staff, served as the President's senior advisor, and had supervisory responsibility for the Executive Offices. Considered by many to be an abrasive and arrogant individual, he resigned under fire after an all-too-public spat with First Lady Nancy Reagan over his private criticisms of President Reagan. This certificate was issued prior to the law allowing brokerage firms to be publicly held, and as such were restricted to employees of the company. Light punch cancellations not affecting Regan's signature. Excellent. Merrill Lynch is one of the world's leading financial management and advisory companies, with offices in 36 countries and private client assets of approximately $1.1 trillion. As an investment bank, it is a leading global underwriter of debt and equity securities and strategic advisor to corporations, governments, institutions and individuals worldwide. Through Merrill Lynch Investment Managers, the company is one of the world's largest managers of financial assets.